My next lens is part II of Ancient Greece Odyssey: The Acropolis of Athens, posted 5/22/07. My third day in Athens, visiting the Parthenon and monuments of the Acropolis. Originally it also covered the Museum of Athens, but that’s now a separate lens. The Parthenon was massive, powerful, yet as familiar as my hand. There it stood high over Athens in the blue sky, sun, and open air. The wind was gentle, yet its soft breath added a sense of timeless presence and the natural world. Birds added a lively presence to silent stone: pigeons, doves, magpies, sparrows and swallows. The old marble is faint gold. How many have walked there? I nearly shed my shoes again, but we had to keep moving. Our guide, Anna, provided a quick orientation to the Acropolis: the sack by the Persians, the Periclean building program (Parthenon’s dates: 448-447 BCE), the Parthenon’s use and the damage it suffered in recent millennia. Yet again, my goal for Ancient Greece Odyssey is to share my journey to and love of ancient Greek sites. Vary blocks of text and photo galleries. Too much of anything gets long. I also found and linked to a good site on Greek art history where my readers could go for more details instead of filling the lens with too much info. Yet again I tried to cover too much on one lens: a whole day in Athens which included multiple museums and monuments. Keep lenses focused on one topic. Don’t use artificial divisions like days. Break your topic into smaller chunks and link lenses together. I later broke the “museums” section onto a separate lens. As of today: Lensrank #32,795, 14 ratings, 4 favorites, 6734 lifetime visitors. Best lensrank achieved: #943. Lifetime earnings: $27.58. 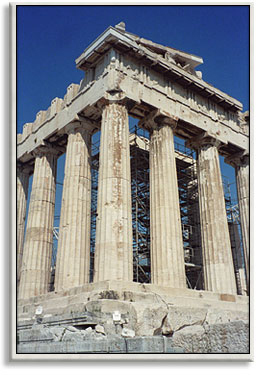 I originally created my Photos of Ancient Athens as an index to my Ancient Greece Odyssey travel diary on May 7, 2007. It’s an index to all my photos of ancient Athens — monuments and Greek art — plus recommended books and links on ancient Greece. Temple of Hephaistos in Athenian Agora. 1st May. Originally, I was thinking of Ancient Greece Odyssey as if it were an online e-book. Books should have indexes! So I made this lens as an index to help people find every single photo, recommended link and bit of info across all my Ancient Greece Odyssey series of lenses. It is too hard to make an index of an online e-book as a Squidoo lens. It’s too much material on one webpage. Lenses need FOCUS. So I stopped keeping this lens updated. I could delete it as a failure. I could turn this lens into a table of contents to all of Ancient Greece Odyssey, so that it became a lensography for my Greece lenses. I could reorganize the content I wrote on this lens to make it more focused. Deleting a lens is almost never useful. There’s always the possibility it could get some traffic and earn a few pennies. In fact, according to the stats tab on the dashboard, this lens draws a lot of traffic — through image searches! People come to this lens for its photos. I realized that if I deleted the long list of photos and turned this lens into a lensography, I’d lose all that image traffic. Instead, I reworked the lens to focus on the content that’s bringing traffic. I added alt names to each image to help boost traffic/SEO. I put them in a more logical order. And I made them into clickable links — if someone clicks on them, they get full-sized versions of each photo. Why? Clicks boost lensrank! Plus the links include the filenames of the images, which means more SEO-boosting content. I also made the decision to license my photos through Creative Commons for non-commercial purposes, on the condition that people link to the front page of Ancient Greece Odyssey if they use any photo. Why? Backlinks boost search engine standings. Offering images for Creative Commons is one way to get people to make backlinks to your site. So what did I learn? Image-heavy lenses draw a HUGE amount of image traffic. If you have photos, exploit them. They’re original content, just as much as text! NAME your photos with keywords, give them alt-tags, and you will get image search traffic! Need help? See my How to Upload Images on Squidoo tutorial for more info. As of today: Lensrank #28,695 2 ratings, 1 favorites, 4430 lifetime visitors. Best lensrank achieved: #3063. Lifetime earnings: $7.81+ some sales of designs. Seventh Lens: Make a Kite! “Lensblography” is my word for a Squidoo lensography done as a blog. Each week I’ll review one of my Squidoo lenses: what it’s about, why I made it, Squidoo awards and stats, and Squidoo tips I’ve learned along the way. This personal blog is not owned by or affiliated with Squidoo.com! I treat Squidoo as a hobby. It’s a place to share my interests and knowledge on topics I care about. I used to post articles like this on my own website, but I love the two-way communication we get with the Squidoo community. I also enjoy writing tutorials. At the end of the day, I feel useful by knowing I helped people. It means a great deal to me to see those, “Thanks, that really helped!” comments. And yes, I like to earn money. It’s not my main goal with Squidoo. I’m not going to write articles simply to push products and earn a commission from an affiliate marketing program. But I do showcase favorite books and items related to my topic on the odd chance I might earn an Amazon commission. (I have also joined AllPosters.com, more to be able to use their lovely graphics on my lenses than to earn commissions). So far I’ve used Squidoo earnings to buy presents for others, books for my dissertation, and the Macbook on which I’m writing this blog.